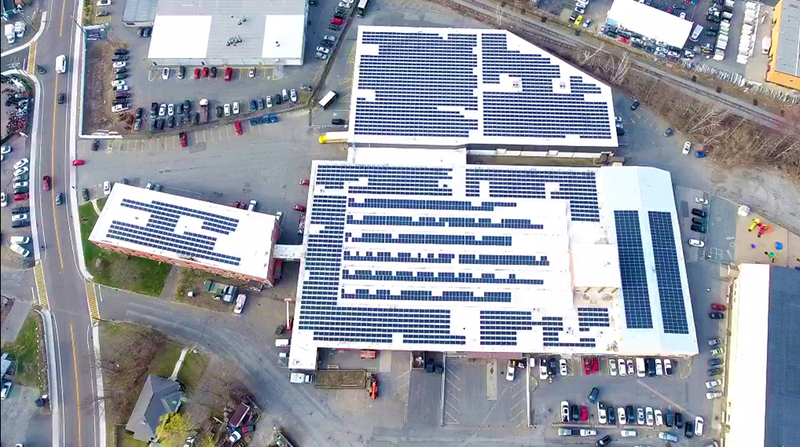 Framingham, MA Stonegate Group, a real estate developer with residential and commercial properties in Massachusetts, has installed a 1,070 kilowatt (kW) solar energy system atop its 92 Blandin Ave. property. Taylor Consulting and Contracting helped facilitate the project and the sale of the Net Metering Credits generated by the project to HallKeen Management for use by two of its affordable housing buildings. Stonegate Group, a leading developer and manager of residential and commercial properties, owns and manages more than 500 residential units and over 500,000 s/f of commercial space throughout the MetroWest area. Stonegate has been a leading provider of rental housing for more than 30 years. HallKeen Management is a leading property management company with over 27 years of experience in multi-family, assisted living and mixed-use properties. HallKeen’s current portfolio includes over 9,500 units and employs 1,000 employees. The company manages properties in the states of Connecticut, Florida, Maine, Maryland, Massachusetts, New Hampshire, New York, North Carolina, Rhode Island, Vermont and Virginia. Half of the portfolio is HallKeen managed and owned; and half of the portfolio is under 3rd party management contracts. Taylor Consulting & Contracting is an Energy Brokerage firm that specializes in sourcing deregulated energy contracts for its national C&I customer base. Taylor’s mission is to be the efficiency hero, optimizing its customers’ energy spend through energy procurement and management. Taylor’s customized consultation helps customers drive operational, cost and time efficiencies by managing energy consumption and spend with monitoring, tracking and analysis. Taylor currently serves more than 33,000 commercial accounts and is endorsed by city governments such as Boston and Philadelphia for energy buying aggregations. Taylor takes a hands-on approach to the evaluation, selection, procurement, and support of renewable projects and contracts, partnering closely with customers and providing strong market insight to optimize investments and savings while creating a positive impact on the environment.